Capitalists@Work: Pinning Hopes on Macron, Were They? Pinning Hopes on Macron, Were They? It was no coincidence that the music Emmanuel Macron chose to accompany him, as he walked in victory through the Louvre esplanade, was Beethoven’s Ode to Joy, the official anthem of the European Union. [His] election was, first and foremost, the rebuttal of what could have been – for France, Europe and the west at large – a slide into a new dark age... the youngest French president in modern history, and a meteoric rise that slickly took advantage of crumbling traditional political structures. Macron won with a strong pro-European message of hope and reform at a time when the very word Europe has become almost a synonym for despondency. That’s why the choice of the Ode for Joy at such a solemn moment was an immense symbol... Anyone doubtful about the meaning of Macron’s victory should really reflect on what the world would look like if he’d been defeated on Sunday. French voters have stalled the national populist wave, and surely that’s not just a source of relief. Like beautiful music, it sends a universal message. The French president is uniquely placed to speak for Europe. If he reaches out to British people, perhaps the disaster of leaving the EU could be averted. This was the year France won and Britain lost. Emmanuel Macron emerged to transform a sclerotic political scene, dazzling the world and many in his country with a youthful energy that made French rejuvenation a buzzword. Macron has shown he can look beyond. Why not reach out to the British people in this historic moment? Why not say: we would like you to stay, we are not seeking to benefit from your departure nor to harm you, and we still have so much to achieve together? Why not say: some of the trends that led to Brexit, among them inequality and a broken social fabric, are problems France and others on the continent also have to deal with? Why not plunge into historical references in which the salvation of France was made possible thanks to Britain’s courage, and now, nearly 80 years on, show French courage in return? ... Many Britons may well just shrug. But some may also rethink, and feel that maybe Brexit doesn’t have to happen. For Europe’s sake, Emmanuel Macron needs help... A young, reformist French president who promised a “European renaissance” finds himself struggling at the helm of a country that is fast becoming “the sick man of Europe” again. It was a telling moment last weekend when rioters disfigured the face of a statue of Marianne, the republic’s symbol, at the Arc de Triomphe in Paris. Just three weeks earlier, world leaders had gathered there with Macron for the centenary of the Armistice. If the “sad passions” that Macron has warned of many times take hold in France, an entire continent will be affected – not just one man’s political career... Now the president looks paralysed at home, and the last rites could soon be read over his European plans. Just as a weakened Merkel didn’t do much to help Macron in relaunching the European project, a weakened Macron will now provide new fodder for extremists and populists across the continent... There can be no European democratic project or social justice without a European democratic France. Marianne’s face must be restored. "Needs help" ... what, a benison from Brussels? Or perhaps a batallion from the Bundeswehr? (if there are any left). For Europe's sake, eh? **A perfect exemplar of Drew's 8th law of politics, BTW: a narrow victory is more significant than a landslide, which betokens little more than that everyone knew what the result was going to be and piled in behind the obvious winner. Much is made of populists like Corbyn, Le Pen et al. Macron is little different, a similar cult of personality that seems to have captured Madame Nougarède and others. One man can't make a difference against France's conservative people where change, even small, is viewed as a threat rather than an opportunity. The quid pro quo was France would tame its public finances in return for German cooperation on the Euro and budgetary areas. 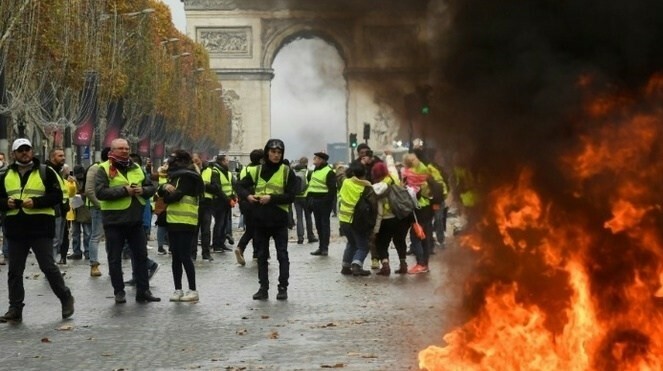 Berlin must look at the riots over petty fuel duty increases and think "nein danke" when Paris asks for fiscal flexibility. In short Macron can't deliver his side of the bargain when it comes to EU reform. Unlike Nougayrède I do not claim to have my finger on the French pulse; but I just got back from France, where anyone I spoke to (mainly my friends & neighbours) was happy to slag off the “youthfully energetic” President. My commune was one of many which voted FN last year – and too many commentators prefer to neglect the fact that the FN came 2nd in that Presidential first round, falling at the 2nd round because the entrenched Left & Right parties combined to defeat it, and Le Pen suffered one disastrous interview. Last Sunday, before lunching with my neighbours, the TV was showing an extended interview with Marine Le Pen: the French MSM share their UK colleagues’ distaste for those dreadful populists, of course, but they cannot afford to ignore or attempt to sideline her and the Rassemblement National… I’d have to grit my teeth to vote RN – far too Socialist for my taste – but from a purely personal and English viewpoint I wish them well next year. "Macron was hailed as a new breed of politician but he was really the past ... the last technocratic centrist in the tradition of Bill Clinton, Tony Blair and Gerhard Schröder. ... the real role model ... was Schröder who pushed through tough labour market and welfare reforms in the early 2000s designed to make Europe’s biggest economy more competitive ... because German workers have accepted wage cuts and reduced spending power. [but] Politicians need to realise that the financial crisis and a decade of flatlining living standards have made a difference to what is and what isn’t politically feasible." I don't follow the Macron story, so don't really know if this is a fair kicking, but it does have the ring of the truth. Odd how the usual suspects like Ms Nougareyde are decrying rather than welcoming this most spontaneous of colour revolutions, isn't it? And if AFP are right the army are moving into Paris. Surely the US must tell Macron of very grave consequences if he moves troops against civilians? Maybe Mike Leigh will get an idea for a film. I read a French summary of Macron's policy positions before the election. I couldn't believe it. Early in the document there would be something like "we will raise taxes as necessary to fund public services" and then a page or so later "we will reduce the overall tax burden as circumstances permit". Contradictory pairs like this kept cropping up for almost every contentious issue. It was obvious that Macron's options were going to reduce to a) pick one side and alienate the other or b) do nothing and alienate everybody. In fairness to Macron, he seems to have found c) attempt a certain amount and alienate everyone. "the last technocratic centrist in the tradition of Bill Clinton, Tony Blair ...": in what sense are a couple of dud lawyers technocrats? Elby wonders why the French keep electing Napoleon. Macron was elected do that Le Pen wasn't. He's even more of a vacuum than May and that's going some. May of course has a spiritual forebear who was maybe even worse- Tsipras, who won an overwhelming mandate to oppose the EU austerity plans while remaining in the EU and euro, then discovered the EU wouldn't let him do it and folded like a damp tissue. "folded like a damp tissue": this is so common that I can't decide whether in suchlike cases They threaten his life (or his wife's or his children's) or just point out that They've got the dirt on him and he'll be looking at ruin and a very long jail sentence. I observe mildly that there's no sign of Trump's wall yet. Fake but plausible posting linked below? I thought Salford was west of Mcr last time I looked. I note a remarkable absence of media items about France this morning, nothing to see here etc. Anyone know if D-notices really have been handed out? "The Government is treating this as a security threat to all European governments, are trying to prevent a "European Spring" type situation and (BBC) are preparing multiple [re-written stories in case a major incident forces them to break the D-notice - it involves framing it as far-right, portraying the violence as perpetrated by FN supporters and fueled by Russian fake news"
also - what about UKIP on Sunday ? ?